The FCC is back-peddling faster than a mountain biker in front of a bear den after pretty much accusing members of Congress of breaking sacred government rules regarding robo-calls to hold town meetings. See our original report below. Now the FCC says their rules weren’t actually violated, because the venders that made the calls to gather the telemeetings have known and obeyed the rules all along, even if Congress didn’t, and to their knowledge have always followed the rules. No harm, no foul, The Hill reports. The FEC announced this week that tele-town hall meetings held by members of Congress to commune with their constituents are actually illegal. It’s the robo-calls that done ‘em in. 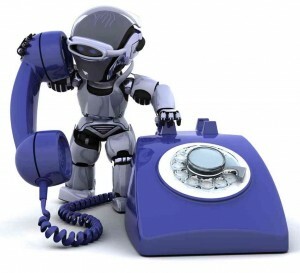 Initially, there was much rejoicing on our part, because as everyone knows, robo-calls are the devil’s tool, especially when employed on cell phones. But these are not phone calls telling us we’ve won a trip to Disney World or imploring us to donate to charities we’ve never heard of, this is democracy calling. So we’re going to side with the stunned politicians who had no idea they’ve been breaking the 1991 Telephone Consumer Protection Act as interpreted by the FEC. In a state like Colorado where there are several sprawling congressional districts, it’s difficult if not impossible for voters to drive 60 miles to the nearest town hall meeting to have a word with their congressperson. And as Americans, it’s our God-given right to have unobscured access to our congresspersons to give them a piece of our mind when it comes to high taxes, job-killing laws, frivolous spending of taxpayer dollars, and stupid government regulations, like this one. Even though we have to suffer the indignity of a robocall inviting us to join in the conversation with our elected officials, we should rejoice just as equally in accepting the call or, rudely hanging up on our congressperson.